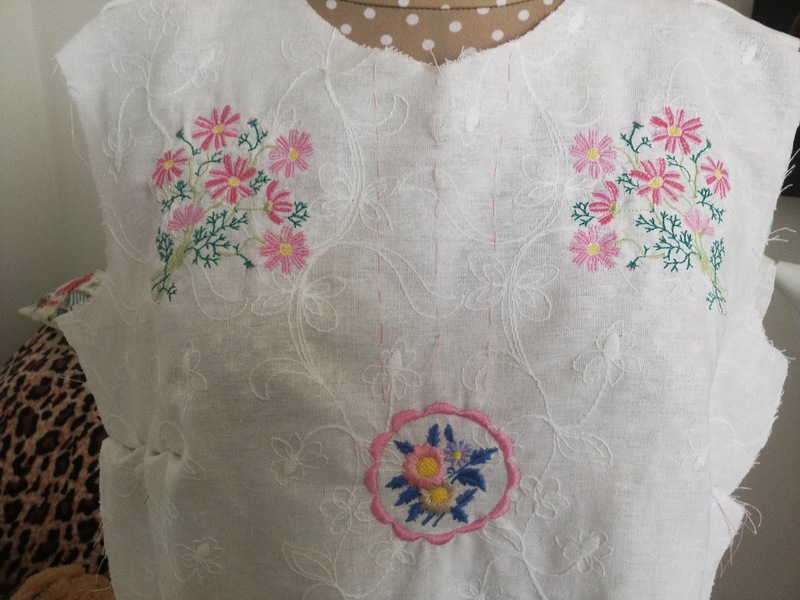 AN EMBROIDERED TUNIC TOP... CONTINUED! This is a continuation of my previous blog post, Making free- standing lace.... 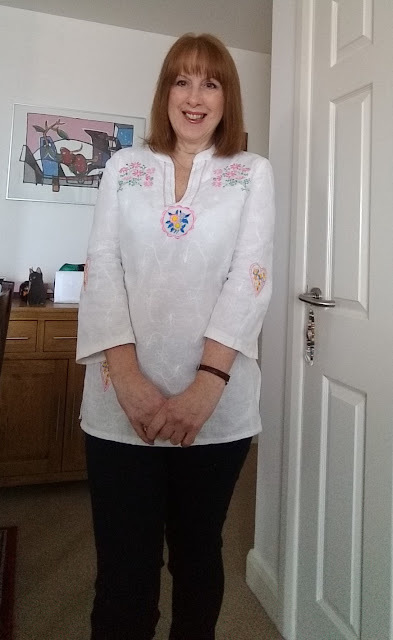 I have made exactly the same top but this time I have embroidered it instead of putting applique lace on. When I find a pattern I like I keep it in a large plastic envelope to use again. I liked​ the Navy Blue top on the previous post so much that I wanted to make another one straight away. The fabric is a length of embroidered Indian cotton from my own stash of fabrics. I have been looking for an opportunity to use it for a few years! I am using my Embroidery machine Brother Innov-is 800E which is one of a range of embroidery machines from Jaycotts. I absolutely love it. I also used Gunold tear-away stabiliser on the embroidery hoop underneath the fabric Gunold stabiliser. It really does tear away from the fabric very easily indeed . The finished design is rather pretty. 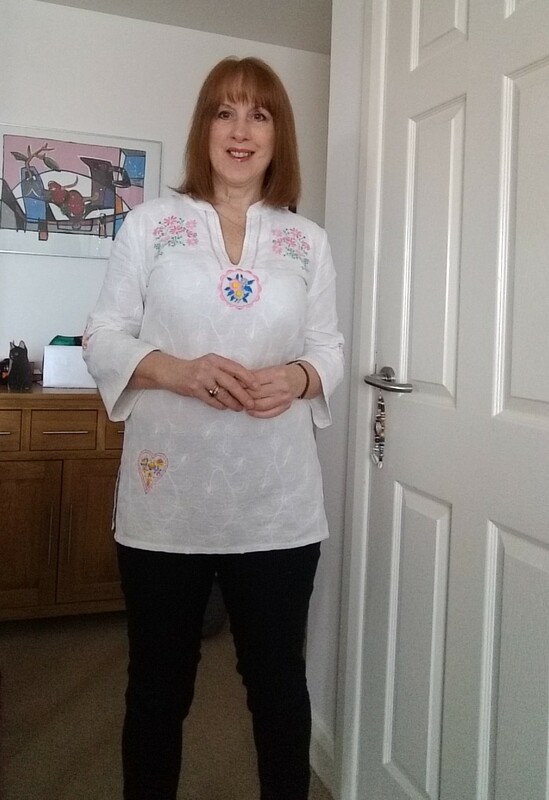 When I was choosing my designs I looked for something which would echo the embroidery on my fabric, but the important thing is for you to choose something which you like! I tacked the front darts in place and marked the cutting line and stitching lines on the tunic front before placing my embroidery. 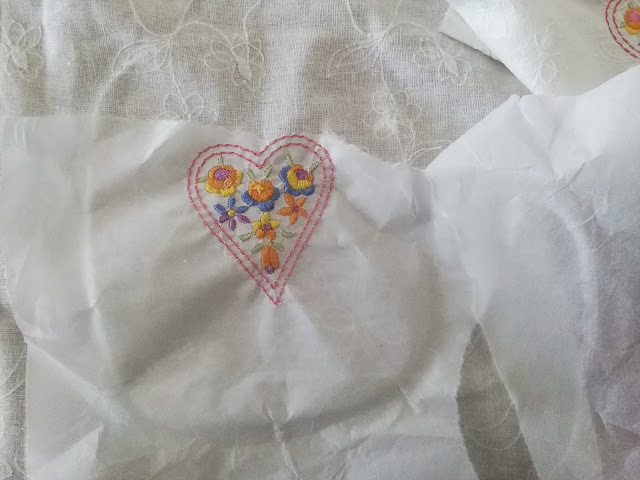 I then measured carefully where I wanted the centre of each design to be, marking the grain lines and centre with tacking thread which I did not fasten off. 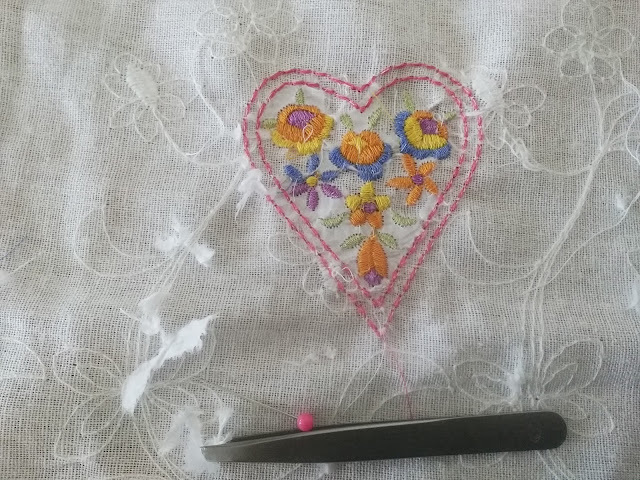 After placing the fabric in the hoop it was then easy to align the centre of the design with my markings which also allowed me to ensure that it was straight and not off-grain. 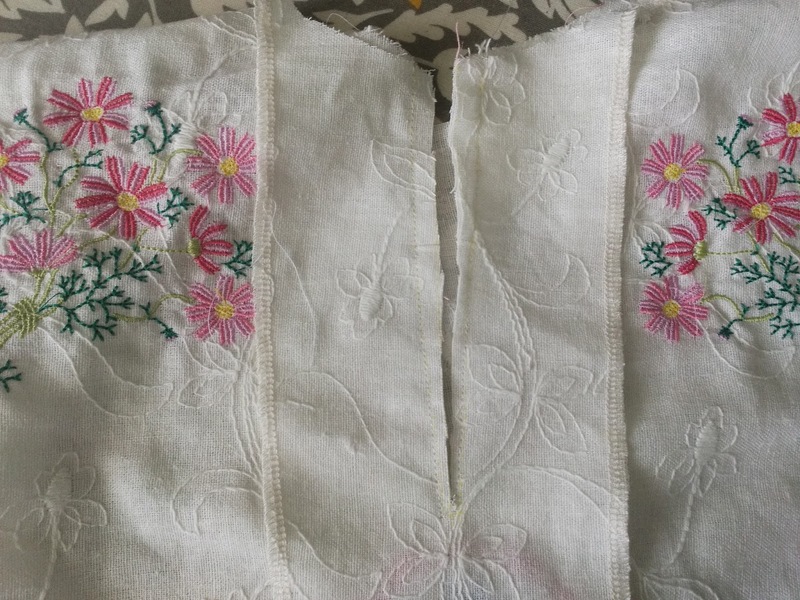 This is important if you are thinking of mirroring a design on a life of fabric, because kept one is off centre or crooked it will be instantly noticeable. Pull the tacking threads out once you are certain that your fabric is hooped correctly. The designs are differnet from each other but I did carry some colours through each, for example!e I used the same pink and the same yellow and blue to provide a little bit of continuity. Please don't get too hung up about it at this stage,but where there is an obvious substitution then do make it. 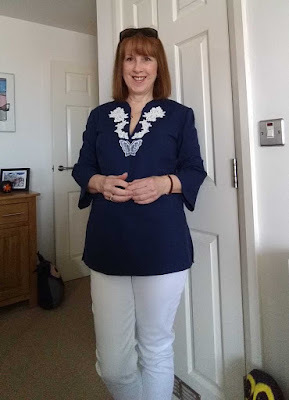 Instead of the French seams on my previous top I used my overlocker throughout. This enables speedy construction! By that I mean just less than two hours after the embroidery had been completed. My overlocker is very easy to use and more importantly easy to thread it is the Brother 3934D Brother overlocker Do telephone for the best price and to discuss other options the contact details for Jaycotts are at the end of this post. 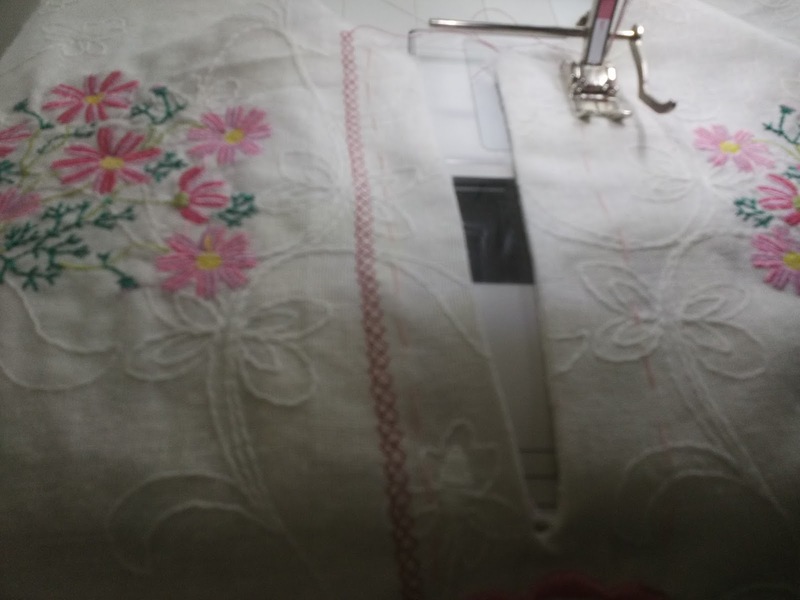 To hold the facing down I am using one of the embroidery stitches on my Bernina Sewing machine Bernina 350PE Again do telephone to find out current prices and other options to suit you and your budget. Did you know that your needle needs to be changed after almost every project? 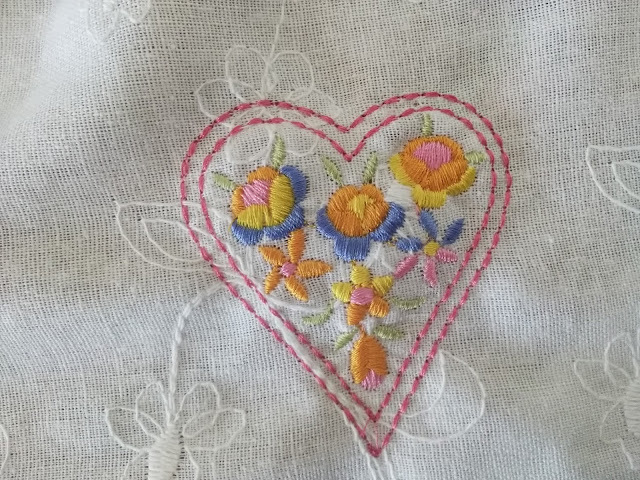 When I am using my Embroidery machine I remove the needle after I have finished using it. Then when I come to use it again I insert a new needle as part of setting it up ready for use. The pattern is very easy to make. There are no fastenings to worry about and it has nothing complicated about it whatsoever. It is suitable for all abilities from beginner upwards. This is my finished top. It is very different from the last one don't you think, I like them both! Please do not hesitate to contact Jaycotts with any questions about their wonderful products and If you have any general sewing questions I am happy to help you too. There is a contact form on the right hand side of my own blog. Contact Jaycotts by telephone or by completing the online contact form and why not pay them a visit and see and try out the machines for yourself? I hope that you are interested enough to consider purchasing an embroidery machine, you definitely will not regret it! We would love to see photographs of your makes by the way!